Even in the depth of winter, I live in the wet. The kind of snow and ice and short days that are standard fare for Samiland are foreign to me. Yet the music of the Sami hits me somewhere deep down. The singing style called yoiking has a primal energy and gutteral force that's similar to Central Asian throat singing, perhaps with a touch of Native American chanting thrown in. One of the most successful artists at bringing yoik into the modern age is Wimme Saari (often called simply Wimme). He hasn't released an album since 2003's Barru, so the new CD Mun is a delight to hear. The album begins simply: the song "Soahkesuovva (Birch Smoke)" starts with a low, growly hum that's joined by Wimme's voice and sparse instrumentation that grows, adding rhythm and a counter-yoik by Ulla Pirttijärvi. Those uninitiated in the sounds of yoik may find the vocal style unsettling, and may wish to start with one of the songs with a more accessible sound. 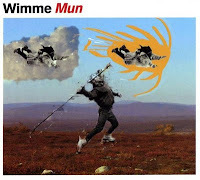 The second track, "In Mun Du (It's Not You)" is one such song, with accordion, bass, and percussion providing a loping rhythm beneath Wimme's vocal melody. Another easy entry point is "Ale (Don't)," on which vocal snippets provide part of the rhythm of the bouncy tune. My yoiking has some elements of the old style yoiking, such as the voice technique and the throat technique. I can also do some traditional yoiks, but accompaniment doesn't quite suit them. When I yoik and the boys play I have to do something new. Colors and patterns are emerging in my mind - I have to let them guide me. In my home area people say that I have created a new style. Young people, of course, like it most, but even people in their 50s have come to me to thank me. This track is a good illustration of this blending. Enjoy. from the album Mun, which features guest artists including fellow yoiker Ulla Pirttijärvi, Pekka Lehti (bass), Iro Haarla (harp), Imre Pemot (igil), Pekka Kuusisto (violin), Eero Grundström (accordion), and Teho Majamäki (percussion).